Tulsa Roots Music and Gilcrease Museum conclude this year’s Music on Exhibit series with a special Mother’s Day concert featuring soul-blueswoman Ruthie Foster. Music on Exhibit is a series of Sunday concerts featuring internationally recognized artists at the museum’s Tom Gilcrease, Jr. Auditorium. The concerts are free with museum admission. 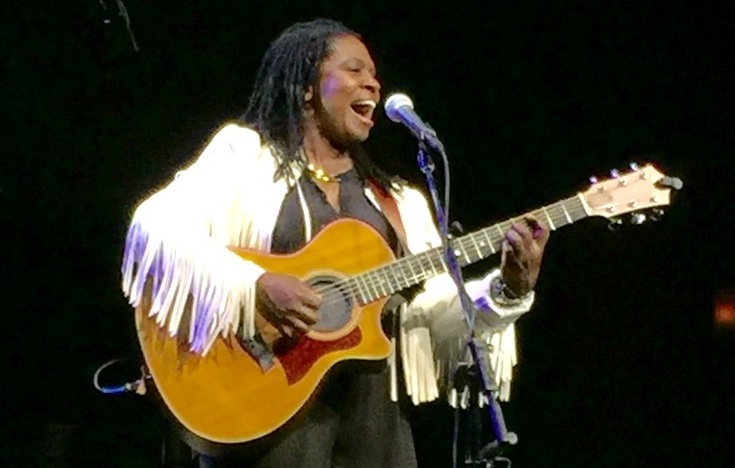 Ruthie Foster was born in rural Texas and raised in a family of gospel singers. With a chapel-bred bravado inspired by powerful African-American women such as Mavis Staples and Aretha Franklin, her sound evolved into an inspired blend of blues, folk and gospel. As a young woman, she honed her pop and funk chops fronting the navy band Pride, followed by a move to New York City to pursue a career as a professional musician. She quickly became a staple in the folk community and scored a deal with Atlantic Records, who thought they had snagged the next great pop artist. But Foster was more interested in exploring roots music than pop, so she turned her back on the deal and returned to Texas to immerse herself in both family and the music that had shaped her. Seems it was the right move. Foster has released a dozen critically acclaimed albums over the past two decades, three of which were nominated for Grammys. She’s won numerous Austin Music Awards, Blues Music Awards, and Living Blues Awards. As her reputation grew, she began collaborating on stage and in the studio with the likes of Bonnie Raitt, the Allman Brothers, Susan Tedeschi, Warren Haynes, Big Head Todd, and The Blind Boys of Alabama. She also spends time as a classical vocalist, singing with Austin’s prestigious vocal ensemble Conspirare. Her latest record, Joy Comes Back, comes out March 24.